These features can all be configured through the use of intuitive drop-down menus, check boxes and fields. In this way the user can quickly configure the target device minimizing the amount of time reviewing registers in a datasheet. This area displays device features currently being used in this project. 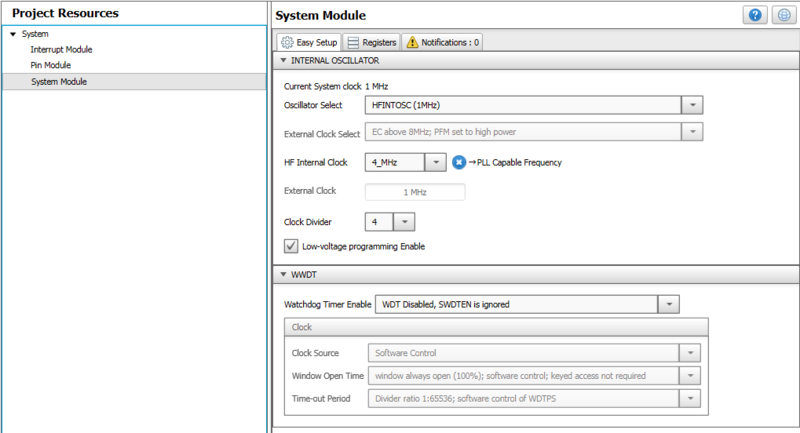 Configure core parameters such as the system clock, configuration bits and other device-level functions. Additional configuration of interrupts used in the project. 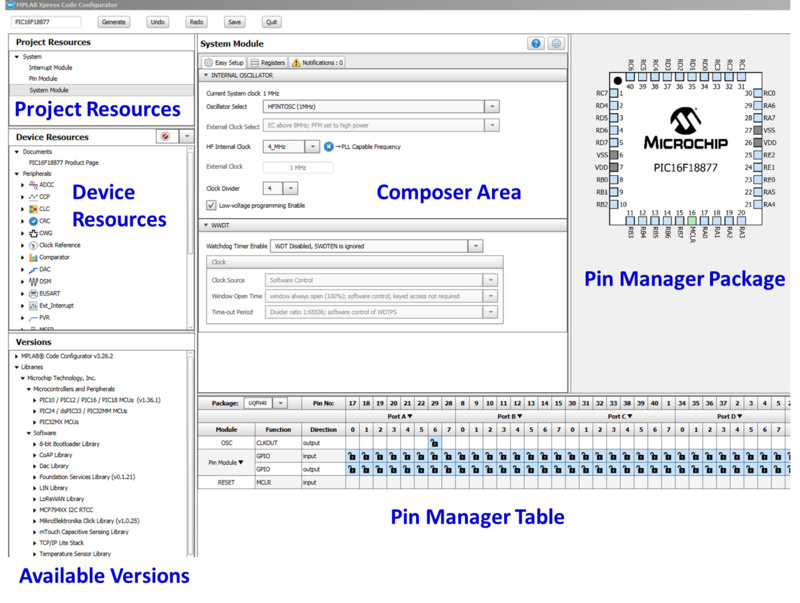 Configuration of individual pins selected from the Pin Manager such as pin direction (input or output), analog functionality and weak pull-up resistors if available. 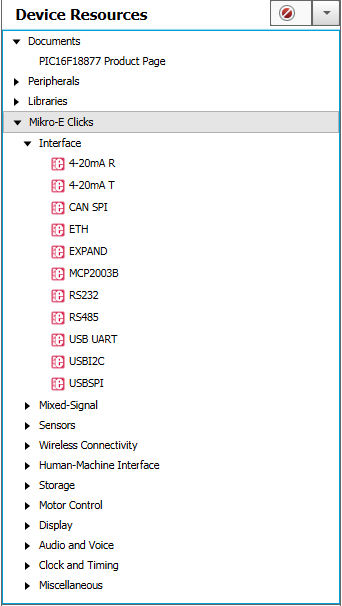 This area displays features that are available for use for the selected target device. 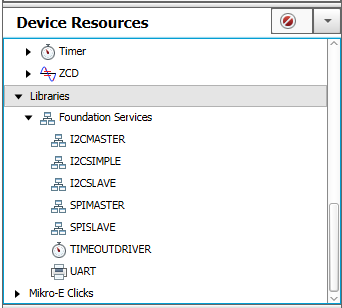 Features are added by double-click on the listing in the Device Resources section. 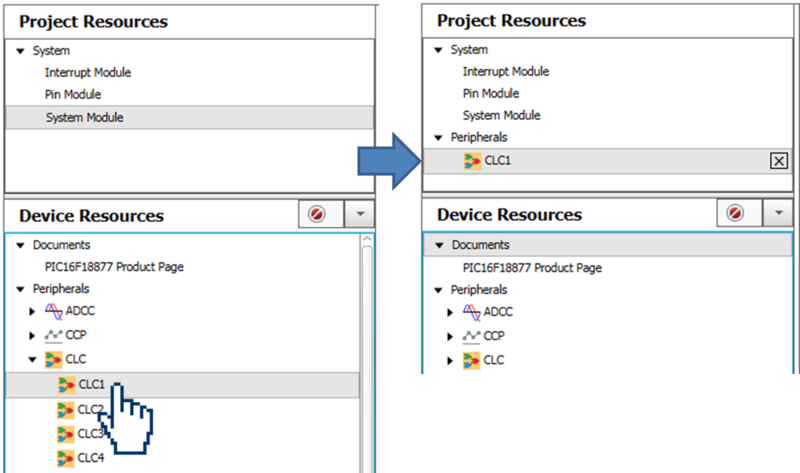 Links to the selected device's product homepage where the datasheet and other documentation such as relevant application notes can be found. All peripherals that are available on the selected target device. Any libraries that have been created and are applicable to this device. Provides easy configuration of a variety of MikroElektronika Click Board expansion boards. 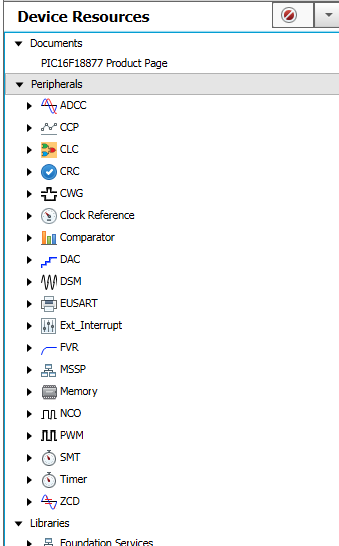 Main interface area in which a peripheral, library or driver is configured. 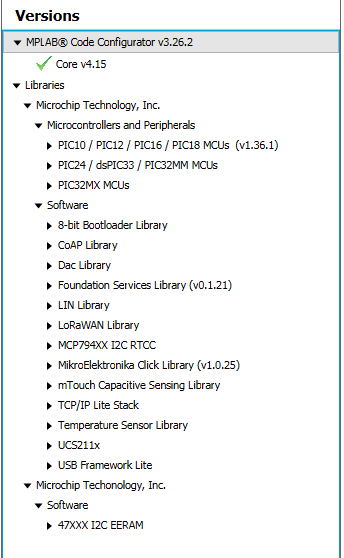 Presents the registers associated with device peripherals and features. Registers can be configured using either drop-down menus or by entering a hexadecimal value next to the register name representing individual bit settings. Will display important information concerning various modules that have been configured including warnings, hints and general informaton. Lists the pin by pin number across the top of the pan and by Port just below the pin numbers. Blue colored pin : indicates a pin that can be used by module signal. 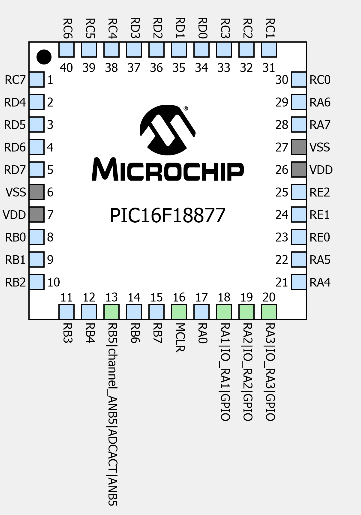 Green colored pin (with a lock) : Indicates that the pin has been allocated to a module signal. Green colored pin (with a chain link) : Indicates that the pin is shared between multiple modules. Yellow/Orange colored pins : possible alternate pin for an already allocated pin function. 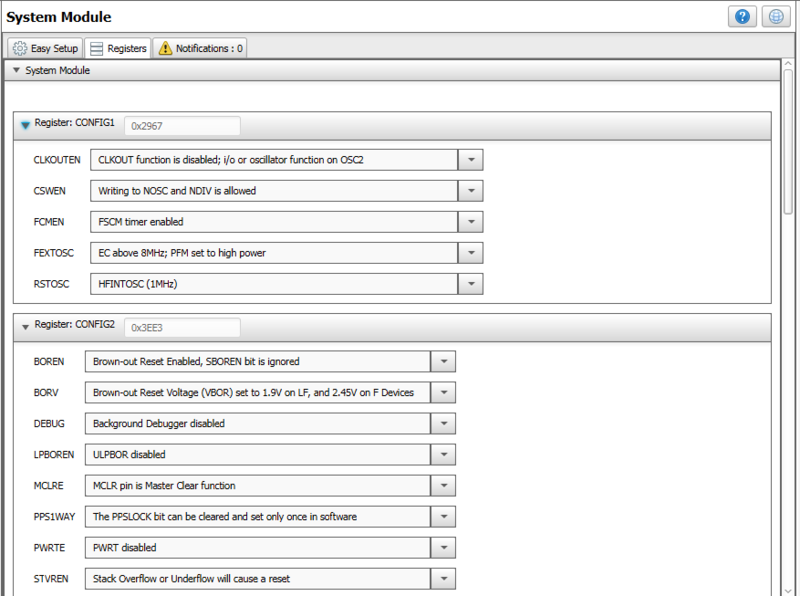 The Package: drop down menu can be used to change the Package View to any available package for the target device. Displays pins on the selected device package. Color codes follow above adding Gray colored pins indicating that the pin is not usable in the selected configuration.